Initial vision loss creates stress and persistent psychological stress further accelerates vision loss, creating a vicious cycle of stress and progressive vision loss, according to a recent study published in the EMPA journal, the official journal of the European Association for Predictive, Preventive, and Personalized Medicine. “There is clear evidence of a psychosomatic component to vision loss, as stress is an important cause not just a consequence of progressive vision loss resulting from diseases such as glaucoma, optic neuropathy, diabetic retinopathy, and age-related macular degeneration,” says Prof. Bernhard Sabel, lead investigator of the study. The study is based on a comprehensive analysis of published researches and clinical reports on the relationship between stress and ophthalmologic diseases. Prof. Sabel has pioneered a holistic treatment approach that combines stress management, patient education, and vision recovery and restoration techniques. “The behavior and words of the treating physician can have far-reaching consequences for the prognosis of vision loss. Many patients are told that the prognosis is poor and that they should be prepared to become blind one day. 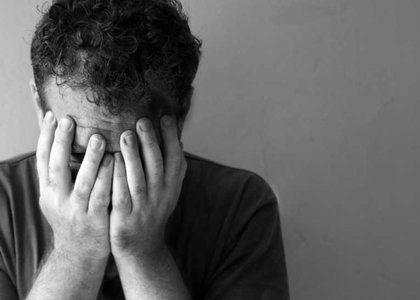 Even when this is far from certainty and full blindness almost never occurs, the ensuing fear and anxiety are a neurological and psychological double-burden with physiological consequences that often worsen the disease condition,” adds Dr. Muneeb Faiq, PhD, All India Institute of Medical Sciences, New Delhi, India, and a co-investigator on the study. 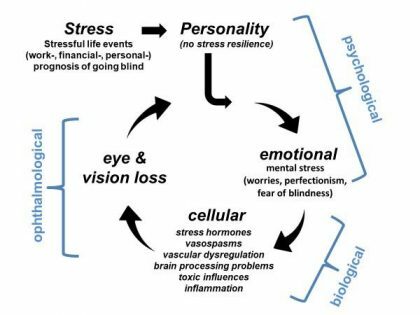 Increased intraocular pressure, endothelial dysfunction (Flammer syndrome), and inflammation are some of the consequences of stress causing further damage. The investigators believe that the holistic approach can be used more widely in the clinical management of eye diseases. The authors suggest that stress reduction and relaxation techniques (e.g., meditation, autogenic training, stress management training, and psychotherapy to learn to cope) should be recommended, not only as complementary to traditional treatments of vision loss but possibly as preventive measures to reduce progression of vision loss. Secondly, doctors should try their best to inculcate positivity and optimism while giving their patients the information to which they are entitled, especially regarding the important value of stress reduction. In this way, the vicious cycle could be interrupted. The study concluded that future clinical studies are ongoing to confirm the causal role of stress in different low vision diseases to evaluate the efficacy of different anti-stress therapies for preventing progression and improving vision restoration in randomized trials as a foundation of psychosomatic ophthalmology. The study will be presented in November 2018 at the 5th International Conference of “Low Vision and Brain” in Berlin.